Everyone joined in to make the land and sea paella entrée. 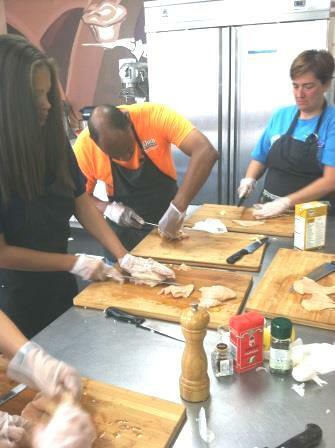 Foodies were learning how to filet the poultry and prepare the seafood for our delicious Spanish dish. My travel to Spain taught me about the various ways this entrée is prepared. The class learned a specialty dish that is primarily prepared in the homes of the Spaniards. Paella mixta is too expensive and is why the restaurants in Spain only offer land or sea. I made sure to bring home saffron threads from my travel but I am running low and it is a good thing that a friend of mine is traveling to Spain as I have put in my order for this fragrant spice. Ol`e readers!